Over the weekend I was lucky enough to give readings in this oh so bohemian tent. It was created by Alese Osborn, a talented Tarot reader located in Oakland, California. Check out her website here. Our Full Moon resides in fiery Sagittarius, which is the astrological sign for the card Temperance. This is juxtaposed with The Sun currently being in Gemini, which rules The Lovers card. Right off the bat I am being drawn to the theme of duality present in both cards. Two cups, two people. This leads my brain to balance, harmony, feminine vs. masculine, spiritual vs. material, choices, relationships, past vs. present, present vs. future. Seeing the bigger picture is key. Tonight is not a time for compartmentalization. Separation. Nit picky. Nope. Rise above and expand. This goes for anything..even the small stuff. Blend the icky stuff into the good stuff like the angel in Temperance and move forward with new perspective. Blessed Be...and Happy Full Moon. I lost my father this past week. I could have blogged about the effects of the Tower card and Death card. Would have been typical, and expected. I mean, don't get me wrong, they had a huge hand in my experience as of late. But something told me to post a huge image of the Sun card today. What does the Sun mean in tarot exactly? Well it is considered one of the most positive archetypes in the Tarot. Simple joy...childlike enthusiasm...warmth...love...bliss...confidence. So why I am I featuring it in my blog about my heartbreaking loss? Hmmmmmm. Well. Since the moment my father's health took a turn for the worse a couple weeks ago, my mother's home has been flooded with friends and family showing the best part of human nature: giving and sharing from the heart space. Old friends and distant relatives have been resurfacing in my life and expressing words so sincere and beautiful. Flowers are arriving. Food is constantly being cooked. Yes the painful tears are being shed, and the shock has definitely not worn off yet. There are trying times to come. But laughter has also been present. My father was an outrageously funny man, and I have been reminiscing with loved ones about stories so rich and so dear. He himself was a beam of light. Bright piercing fierce light. Ferocious fire. Filled with passion and not afraid to express it. To solidify why I am choosing The Sun card today of all days when I am missing my father so so much, I must share that The Sun card is actually his Personality card. Through using numerology, one may find out what their soul, personality, and hidden factor/teacher card is for this life. My teacher card is The Sun. So there you have it. What my father naturally embodied in this life, I must learn to possess. So in closing, I vow to carry on the virtues of The Sun. The virtues of my father. Passion. Vitality. Warmth. Love. Strength. Trust. Confidence. Zest for life. Joie de Vivre. Creativity. Wisdom. Abundance. Optimism. Fire. The ability to have wonderful relationships with others. The list goes on and on. 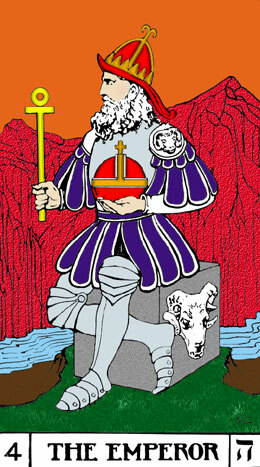 According to a numerological equation, the card for February 18, 2014, is The Hermit. Today provides an auspicious time to be alone and cultivate new ideas. Coming out of sickness or a rough period? Rest and chill out. If you are a musician, today is the perfect day to write a new tune, or get some practice time in. Writers, write. Paint. Draw. Collage. Dance. Do yoga. Whatever it is that enhances your craft. Crawl into your own world, so that when you re-emerge, you are on top of your game and ready to make things happen. We are not talking about an angry, sad, lonely Hermit here. It's ok to be solo, and figure stuff out. Think. Muse. Wander. Blessed Be folks. "Fill each other's cup but drink not from one cup." 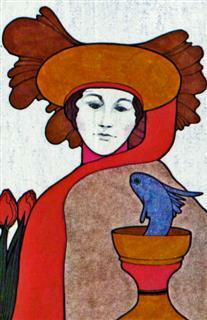 Valentine's Day is tomorrow, and it has me thinking of the Two of Cups card in Tarot. You see the happy couple. They are seriously vibe-ing. But they both have a full cup to offer. They may offer each other a little taste, but if they are separated, they can sustain on their own. It is important to embrace one's own life. Only then can we offer something delicious to someone else. Enjoy the love, lovers. After four days of rain, I feel transformation has graced my life, and the city I live in. Winter is on its way out, and Spring is practically here. The water brought me creativity and epiphanies. The air is clean, and foliage is ready to blossom and grow. Mercury Retrograde in Aquarius is pointing us in a new direction that better suits our needs. The coming of the Full Moon is filling my mind with energy, and I know I am not the only one. So here is to moving forward and embracing the new and exciting. Rainy weekend in San Francisco. After a long drought, filled with sunny days, the water element has finally graced the Bay Area with a much needed bath. Water brings creativity, introspection, intuition, and emotion to the forefront. A healthy dance with water lends itself to fluidity, changeability, increased psychic abilities, and amazing ideas. Catching up on rest and mellow vibes are always good ideas for a day filled with rain. So let the raindrops on your window pane lull you into a yummy trance, and enjoy this much needed time.